All of our company's contact information appears on this page. We encourage you to use the method that is most convenient. Or if you would like a member of our team to reach out to you, please complete and submit the short form that appears below and you will receive a reply within one business day. Our entire staff understands that you have many choices when it comes to veterinary feed products and supplements and we greatly appreciate your interest in APIC USA. If your inquiry is of an urgent nature, we encourage you to call the telephone number that appears in the bottom-left corner of every page of our website. Please call us weekdays from 9 a.m. until 5 p.m. (Central Time) at: +1 630-796-0050. Please send all faxes to: +1 630-796-0040. Please address all e-mail correspondence to: info@apicusa.com. Please check this box to confirm your understanding that submission of this form grants a member of the APIC USA team to contact you via the method(s) you have indicated above. 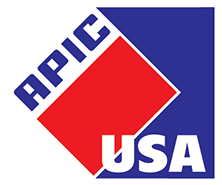 All content included in or made available through APIC USA., such as text, graphics, logos, button icons, images, audio clips, digital downloads, data compilations, and software is the property of APIC USA., and protected by United States and international copyright laws. No portion of this website may be reproduced, redistributed, retransmitted, or otherwise copied, stored, or broadcast in part or in full without prior written consent from APIC USA. 1434-B Brook Drive, Downers Grove, IL 60515, U.S.A.